The infant in this video will forever banish the common perception of babies as helpless, passive and incapable. What would Ruby have learned if she had been handed her toy? (Raise your hand if you wanted to hand it to her. I did!) Or what if it had been moved right next to her? She would have learned nothing developmentally useful except that there are more capable forces in the world – adults – who will do things for her. Determination. Perseverance. Tenacity. Enthusiasm. Tremendous effort. Success. I can do it! I took this video of Ruby (just a week shy of 6 months old) recently and it demonstrates one of the things I love most about RIE — the idea of letting babies have uninterrupted, self-directed play time with simple, open-ended toys. I see Ruby working hard reaching for a toy she wants. She tries over and over. A few times she bats it away by accident, but she keeps trying. She finally gets what she wants, but she doesn’t want a pat on the back (like I would) or my approval. She just wants to chew on that darn thing! When I see this type of “play” I can’t help but think/hope that these are life lessons she is learning that will stick with her for life. Oh, and I apologize for my Darth Vadar breathing! Kudos (and thanks!) to Amy and Ruby for this magnificent video! I have a video of my eldest daughter at around 7.5 months spending about 15 minutes rolling and schooching to try and get a toy. Crazy thing is she was walking 2 1/2 months later. I love your children’s comments almost as much as Ruby’s delightful play. Children are sooooo beautiful and such wise wise teachers. I wish we could see the less comfortable moments. Surely my baby wasn’t the only one who immediately started crying when he discovered something was out of his reach? And no, I didn’t hand it to him, but it’s hard to know how to know how to let them get from instant frustration to calm struggle. Now he’s almost walking, and his biggest frustration is separation, but I’m not sure I’ve witnessed this kind of patience yet. I agree, Meagan. I think this baby was more determined (maybe innately) than the “average” baby. Some of it is personality. I have 3 kids and they have all had different levels of independence. If your baby were getting easily distracted in this same situation, I would have put the toy just a tad closer, so that he felt like he had the chance to succeed, then gradually have it be more out of reach as the days went on. I’m not sure if that’s what the experts would advise, but that’s what I would have done, anyway. But when they get that look of “I can do it,” like this baby had, I do think it would be bad to then do it *for* them. Meagan, does your baby try to reach the object before becoming frustrated? It IS “hard to know how to know how to let them get from instant frustration to calm struggle.” Sometimes, the way to do that is to take a close look at our feelings and the way we are responding to the frustration. Most of us are inclined to feel tense and perhaps project and overreact. Our feelings always set the tone for our child. When your boy cries regarding separation, first calm yourself, then acknowledge the situation evenly (“I hear you. You don’t want me to go. I’ll be back after your lunch. Daddy will stay with you.”) and proceed with confidence. If it’s about him struggling to achieve something while he plays, calm yourself and acknowledge the situation…slowly… “I hear you. You’re having a hard time pulling those plastic beads apart. Wow, that’s hard to do.” Don’t invest in him achieving something, just be there calmly in the moment, communicating. As @Kate noted below, babies are into the “effort”, but sometimes we unwittingly teach them to believe that they must accomplish the act, whatever it is. Babies don’t usually think this way. If they get tired of trying to do something, they usually move on to something else or need a break. But if we do it for them, they learn that they are supposed to “finish” things. Having said all of that, there are definitely children who are more prone to frustration than others. And tiredness will make everything feel impossible! Eh, he’s close to a year now, he rarely gets frustrated by things he can’t “reach” anymore. He generally loses interest quickly when things are beyond his scope. When he was smaller, I think he’d reach for a toy, find it was out of reach, and begin crying without really trying to move himself, right up until he started crawling at 7.5 months. No creeping or rolling for him! The separation thing is a bit odd… it’s not so much when I leave the room, though there is some crying then. It’s more when I’m in the room with him, working on my own stuff. As I said, it’s usually when he’s getting close to nap time, and he’ll come up to me and demand to be held (standing, in my lap is not good enough :-)). Instead I usually sit or lay near him on the floor and let him play for a bit longer before putting him down for a nap. If I sit, sometimes he’ll resume playing, and other times he’ll sort of climb into me and cry until I get up and take him to his bed. If I lay down he’ll play with me, “attacking” my head or belly (zerberts and baby kisses). Mainly I just meant that although I love these videos of happy babies in deep concentration, I’d love to see more footage of parents helping (or letting) them work through the more frustrating times. Because the state we’re wittnessing above, that’s after a bit of practice, right? This isn’t default? Some children have greater persistence thn others, it’s a temperamental trait (see the wonderful Alicia Lieberman’s book on toddlers for more on this). So we as adults do have to help scaffold for those children who need more support in sticking with a task. 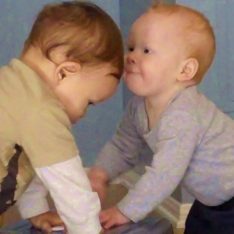 This is a lovely video and real witness to the RIE approach, I was fortunate enough to see Magda Gerber years ago, she had a huge influence on my thinking about infant competence! Thats amazing! I loved watching this baby and her incredible determination! I was thinking the whole time “how many adults would have passed it to her by now, or bumped it a little big closer” the absolutely only reason I wouldn’t have us because of my RIE training! You are way stronger than I am. I totally would have handed her the little toy! I almost reached right through that computer to give it to her! Bravo, mama, for holding out! This just drives home for me that our short attention spans are not about technology. So easy to blame the iphone, etc for our speed of interrupting ourselves and each other, but this quiet, calm video is an opportunity to see the impulse that arises regardless of checking email, or being ‘pinged’. It’s simply hard as a human to be still. To slow down. To allow. Great insight, Miven. Thank you! I remember my little Sarah used to streeeeetch and twist and bend to reach different things. It was so beautiful to watch. Such determination, just like Ruby, such perseverance. If ever someone did give her the toy she wasn’t particularly interested in it. The fun for her was in the effort to get it! Exactly, Kate! That is one of the big differences between adults and babies. We want the prize at the end, babies care much more about learning, challenging themselves, experiencing. I am surprised there are not more comments here. This video really struck me; (as others have said) the determination on this little girl’s face is amazing. I was also left wondering, though, how she got into this position (on her stomach). 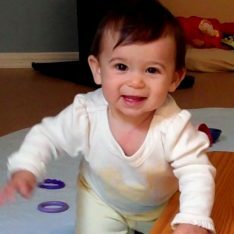 I have read several times on this blog the belief that babies should not be forced into “tummy time.” So I suspect that little Ruby chose to go there (onto her stomach) and enjoys being there. I’m amazed by this because neither of my kids (even my little guy who’s 7 months old) ever wanted time on their stomachs! I was also struck by how difficult it is for me to keep my 3 year old from handing things to her brother. She just wants to share, share, share with him. Thanks again for posting this beautiful reminder. Hi Kiyah! Thanks for bringing up a common misconception about tummy time… When infants have adequate floor (or playpen) time to move freely on their backs (as Ruby has had), they learn to roll to their tummies and end up spending LOTS of time there by choice. Babies demonstrate developmental readiness for tummy time by choosing it. Then, there might be a day or two when the position feels new and not so comfortable, but they soon adjust…naturally. Trust in the “body wisdom” of babies in regard to tummy time is one of the concepts unique to the RIE approach. I fear mine would have given up and cried after a few minutes! The interesting thing is that this video is only a few minutes long, but it feels much longer, doesn’t it? It is so challenging to calm ourselves and patiently see from the baby’s point of view without projecting our agenda or concerns. i had my children 41 yrs ago. i knew nothing of the psychology of a new born, or, what raising a child was all about. it was the 70’s and all this wonderful information that new mothers have now was made available because of the direction of the baby boomers. we wanted to change and we did and so our children now pay much more attention to the development of a childs mind and not how well their table manners will be. the children of this generation now will have an amazing legacy that they are giving to their babies. the science of the mind. i think it is part of the big plan for us all. Lucky granddaughter to have a grandmother who understands this and appreciates it! This video is perfect, I love it. My wonderful little boy is now 16 months and at 6 months he certainly would have cried with frustration and I would have ‘aided’ him much too often. Since reading and learning from Janet’s blog I now appreciate cries of frustration as necessary and powerful for growth. I make efforts every day to accept, listen to and just be with all of my son’s cries, to view them as valid and not try to stop them or ‘help’ him or distract him from them. I am working very hard to give my son the space to struggle and fall and succeed without my ‘help’. It is liberating for me actually to just be with him and trusting him to know what he needs and to tell me. Thank you once again Janet. Hi Sami! Thank you so much for sharing your experience and kind words. I’ve enjoyed the videos on your blog very much, I stumble upon your blog from another favorite video of mine the baby Liv video. With my first I got delight in watching her strive to do something difficult. I admit I would put toys deliberately out of her reach just to watch. The anticipation tickled me and the feeling of “touchdown” was wonderful. My amusement was her benefit then! I also got a fiendish sort of delight in seeing folks get apoplectic on the playground watching a one year old climb up stairs. I had my own heart attacks but I encouraged her anyway. I didn’t want to foster fear, but still be safe. My daughter will often work through things without much fuss, but I totally agree with Meagan. It would be great to see how struggles are handled. YES!!! Of course I’m interested! In fact I’m interested in any videos you might be willing to share about just about anything pertaining to babies or the RIE approach. 🙂 Please send either the file or the link to me at janet@janetlansbury.com Thank you so much, Kari! Absolutely, I’ll send it your way! I will upload it tonight, most likely. Bingo, Skyfire! You are very insightful. Also, children don’t mind being “in-between” the way we do. Showing or “helping” them projects our agenda, when the child might just be interested in trying or working on something. Children have a lot to teach us about feeling comfortable being “in the process”. Lovely video. My daughter did the exact same a little before turning 5 months and I videotaped it for my husband. She worked really hard on reaching those books she wanted and I never went. She finally managed to get one and seemed satisfied. She started crawling a couple weeks ago and is very fast. It was, indeed, hard to watch her struggle but I think she learnt a lot from it. I was inspired by your post (as usual), and right away placed my baby, who is the same age as Ruby, on the floor with a couple simple toys just out of reach. Within about 10 seconds she was frustrated, and put her face right into the mat and cried. I know I should allow for some frustration to aid in problem solving skills, but I’m not sure how much frustration is too much. I watched her calmly for about one minute, but I scooped her up because she seemed so mad that I was leaving her there struggling. Do you have any suggestions for limits for babies’ frustration? There are probably better ways to respond than picking her right up, but that was my instinct. What should I have done differently there to encourage her? Hi Erica! It would be easier to answer your question if I knew what your baby’s typical day looks like — but it sounds like you might have tried to take her straight from point A to point Z. Her reaction indicates that this was an unfamiliar set up for her. She may well have sensed that you were setting up a challenge for her and perhaps had an expectation, rather than just allowing her time to play on the floor and trusting her to work on the things she was interested in doing. Also, if she isn’t used to inner-directed floor play, this can be a jarring, unwelcome experience. Babies like to continue doing what they know, so the habits we create matter. This video was not a set-up by Ruby’s mom to test her abilities. It was just a snippet from Ruby’s play time and Ruby just happened to seek out that particular toy. Ruby’s experience was made possible by the fact that uninterrupted, inner-directed floor play is the way she spends a good part of each day. Babies like this do not expect to have toys handed to them or to be taught or shown how to play. They also spend very little time in carriers, seats, or other devices that restrict free play and movement. When encouraged to play and move freely, children will naturally seek out the challenges they are ready to work on. 2. If she communicates (i.e., talks, grumbles, cries) respond immediately, just as you would if I grumbled, talked or cried. BUT, respond by communicating back to her, not scooping her up (just as you wouldn’t scoop me up before finding out what I was saying). 4. Then hold her with you while you stay seated on the floor. After a while, unless you’ve discerned that she needs something else (to eat or go to bed), offer her another opportunity to play on the floor. Calmly communicating, rather than reacting with panic and lifting children into the air just because they cry, allows them to adjust to new situations more readily. Thank you so much! I think you got the scenario exactly! Now I realize, I was trying to take her from point A to point Z. It’s funny we tried some independent floor play today and actually it went more like you described above (before I read your response). It was much better and welcomed with smiles. She didn’t roll to her tummy on her own yet, but a much better start! How patient both mom and baby. The rub comes if the baby gets frustrated and how long do you wait then to intervene? You can certainly see the crawl development, can’t you? Julie, I always believe in responding immediately when a baby communicates anything. If a baby challenging herself the way Ruby did became frustrated and looked toward me, I would respond first by reflecting and acknowledging the situation. “You are working so hard to move forward and grasp that toy. That’s hard to do.” If she didn’t look toward me, but because upset, I would probably do the same. Then, if she continued to cry, I would always ask first, “You seem tired of trying this. Do you want me to pick you up?” Babies who are used to be invited to communicate with us, will indicate “yes” or look away, which might mean NO. When in doubt (or just to be polite and respectful) ask. Yes, Julie, this is the way the crawl begins! I love this. Wonderful demonstration of learning for its own sake. This is what Seligman in Learned Optimism and The Optimistic Child says buids “mastery” and “resilience.” I say the same thing in my ebooklet “Depression Proof Yourself – And Your Kids!” Don’t help them unless they’re in physical danger. Protect them from injury and let them work it out themselves. Great stuff! What if the message this baby is getting is very different? what if she is learning that there is nobody who would help her when she needs it? that her parents will stand by and watch how she struggles without helping her? what if she’s learning that she should not rely on anybody especially her parents in the hour of need? Marina, those are certainly the kinds of fears that can prevent children from ever having opportunities to challenge themselves and achieve mastery. The best way to understand a baby’s point of view is to observe her as objectively as possible. Then, commmunicate, communicate, communicate with this small person. ASK her how she feels. Babies will tell you! Janet. This is such an important discussion(s) around a core concept for raising strong, self-confident people who can take responsibility, make decisions, learn from mistakes, fail and keep going. I’m sixty-seven, and I can relate to that baby–still to this day. I’ve watched the above video countless times and even forwarded it to my husband with the message, not only do I want what Ruby is experiencing for our baby but for me as well. Thank you for the inspiration as always! Yes, Diana, Magda Gerber and others have referred to this as “benign neglect”. My first child hated being put down at all and was very easily frustrated. Now, two years later and with a second baby, I find that she is so different and much like Ruby in the video. Very independent, loves to be down on the floor exploring on her own. She learned to roll much earlier and loves being on her tummy (her own choice by rolling to be there). I find myself often wondering how much of this is her own personality, my shifts as a “seasoned” parent, or just the fact that I have to split my attention and so she has adapted to be quite independent. I sometimes wish I could go back in time and repeat much of my first-born’s babyhood as I fear he lacks this instilled confidence and persistence. I wonder if you have any tips for helping a toddler gain those things? Thanks! I want to thank you for this enormously valuable and thought-provoking site. I am deeply appreciative of so much here, it matches much of what I felt instinctively about bringing up my baby, though I didn’t discover the website till my daughter was a toddler. A question that this post and the related conversation raised for me, that I’d love to hear your thoughts about, is: What about children who are very committed to particular ideas in their play (or otherwise)? You have mentioned that children will often leave a task that is too hard for them, so it is best not to try to help them get there (sending the message that they have to be successful). That makes tremendous sense to me, but my daughter does not fit that pattern. My daughter (nearly 2 and 1/2) is so committed to ideas (even those that defy the laws of physics) that she gets very frustrated when something doesn’t come together for her. At 11 months, I remember her dissolving repeatedly into frustrated tears because she really wanted to put together two interlocking stackable blocks, and she didn’t quite have the coordination yet to manage it. She was enormously drawn to the blocks, consistently gravitated in their direction, but the result was always the same. I eventually decided to take the blocks away for awhile (a month later, they reappeared, there was less of that extreme frustration, and she was able to master them and enjoy them). Reading your posts, I am asking myself if I should have let her continue to frustrate herself, instead of taking way the opportunity for her to learn from being disappointed — and if I should continue to let her frustrate herself now. Because that’s still very much a part of how she engages with her world: At 2 and 1/2, I see the same tendency. If a doll doesn’t fit on the seat of the car where she wants it to fit, or does fit but doesn’t conform to the exact angle she has imagined for it, she throws the car and the doll. If a blanket is too short to cover the stuffed cat, the cat gets hurled as well. I’m hesitant to ignore this (she’s broken a few toys this way), but it’s not always possible to be right there to stop it. Yet I question, especially after reading what you’ve written, my tendency to fix the “problem” (e.g., move the doll to where she wanted it) or separating her from the source of frustration. I don’t think either of these are particularly good ways of helping her learn to be flexible and adaptive around points of struggle, because I am regulating her engagement with the source of frustration, but I’d love ideas. Do I let her wrestle with the disappointment (even if a few toys get thrown)? How do I honor her strong desire to have things be “just so” and yet invite her to do what those other children do when a task is too frustrating: turn away and try something else? The thing is, she is really so drawn to challenges, and so exact in her vision of how she wants things. She is most drawn to jigsaw puzzles that are a little too hard for her, for example. She can do 12-piece jigsaws on her own, but will usually reach for a 24-piece or 48-piece puzzle. My strategy there has been to make that task manageable for her, but now I wonder if I need to give her more space to be unsuccessful with the puzzles. I’d love to hear your thoughts…. I love this video and passed it on to a few people to watch. I’ve always felt that these kind of struggles are more difficult for the parent to witness than for the child to experience. It’s also something that parents have to continually suffer through even when their children are grown. I don’t yet have children, but I have had to stop myself from assisting my baby tortoise when he tries to climb things that are too high. I just watch him struggle and either eventually he’ll make it or he turns around and tries again another day. Haha I’m sure raising human babies is a tad more complicated, but I’m trying to relate! By all means, practice on the tortoise first! 🙂 Just kidding…and you’re absolutely right about these situations being much more difficult for parents to watch than they are for babies to experience. Observation is the key to understanding our child’s experience and is one of our best parenting (and tortoise-care) tools. I stumbled onto your website a couple of months ago. I was struggling with my baby, who was about three months old at the time – developmentally. She was born 11 weeks early, and is our first child, so we have had a bit of a rocky start. So I was so glad to discover the RIE approach and your blog, and have since bought a copy of one of Madga Gerber’s books! It’s exactly the kind of philosophy I was searching for (without really knowing it). But concerning this post, I have a question – my baby has now learned to roll onto her tummy, for a couple of weeks now, but once she’s there she starts shouting and eventually crying within about thirty seconds most times. So I turn her back over, or pick her up (because she rolls right back over again, despite not apparently enjoying the result). I’m not sure what else to do. She’s also teething, so I think her patience is thin. But I’ve taken to carrying her around a lot again, because she gets frustrated so quickly on her play-mat. I was wondering if you could give me some advice on this? I try to leave her to get frustrated, but after a while she gets desperate and so do I. Is it normal? Is patience something she will develop? How can I help her? Thanks again for a great blog! It’s already helped us a lot. I bet your baby has long since gotten through this, but for anyone coming after, we went through the same thing! Our baby is nearly 6 months old now, and had a similar chapter (can’t remember exactly when) where she’d swiftly roll onto her tummy (which had previously been fine), and just as quickly get really upset. Before we’d read much RIE lit, we’d tried rolling her back over a couple times (BIG mistake: she SCREAMED, and she’s generally a very peaceful baby). She’d gotten from her tummy to her back before, but stopped doing it at all for a while. We eventually just checked in with her when the effort-grunting turned toward crying, giving her a break if necessary: “You rolled onto your stomach. It looks like you’re having a hard time! Would you like a break? [more crying] Okay, I’m going to pick you up now.” Then we’d hold her for a while, wait for her to calm down, and put her back down on her back. She’d often roll right back onto her stomach, which was fine for anywhere from 5 seconds to many minutes, and we’d repeat if necessary. I won’t get in your way, Danielle. What do you do when your baby starts crying because she can’t get her toy? I’ve been having my baby play for her toys when they are out of her reach and after awhile she’ll start to cry and give up. I’ll wait to see if she can calm her self down then i just pick her up and take her away, then i’ll put her back to see if she’ll try again. but she’ll usually start crying again. This is what helps a baby build up muscles so they can raise themselves up and walk too! I love this video 🙂 I also LOVE that play mat but I can’t find anything like it anywhere. It’s a long shot, but does anyone know where I could find something extra large like that? !